Attention San Diegans, It’s almost that time again! The time where we all get together as a community to help those who need it. 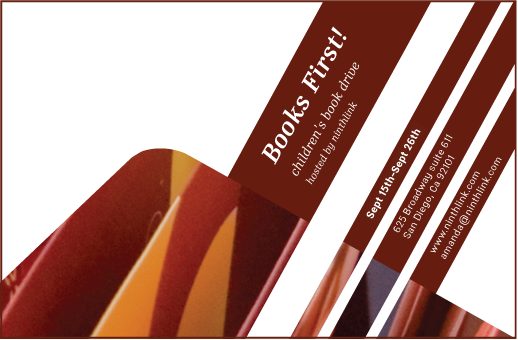 This month we will be hosting a book drive on behalf of Books First! to collect new and gently used children’s books which will be distributed to classrooms all over the county. Drop off those pre K through High School books (excluding text books) that have been sitting around collecting dust and put them to good use, by helping San Diego’s children learn to read! Picture books or chapter books, we’re accepting them! I will be sure to bring in books for this cause!